With winter season around the corner, the threat of damage to your trees and shrubs due to snow, ice, and salt increases tremendously. The ice and snow that cover your trees can make the branches hang heavily, raising the chances of them breaking off. By using professional tree care services, you can prevent winter damage to your trees and plants. Winter is the best time to prune trees and shrubs. Particularly, removing the narrow-angled and V-shaped portions, as well as weak-jointed branches from the trunk and crown, can help you prevent winter damage to the vegetation. Although it may seem like a great idea to relieve the branches of the burden by dusting off the snow, it could worsen the situation. This is because branches coated in snow and ice tend to become brittle, causing them to break when you exert pressure on them. 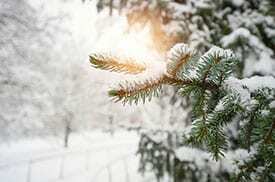 In addition to this, knocking off the snow may cause the limbs of the trees to snap back, causing potential damage to the tree’s circulatory system. Using these tree care services can help the trees withstand extreme weather conditions and reduce potential risk. Tree bracing helps to shift the burden from a weaker limb to other branches using steel cables. Tree cabling helps to restrict the movement of the branches, so they are less likely to break from the weight of snow and ice. How Can You Avoid Salt Damage to Your Trees? Although you do not have much to worry about the snow built up against your trees, you must avoid using salt to melt it quickly. Try using coarse sand instead to make driveways less slippery. Keep your plants healthy to help them withstand salt spray and accumulation of salt in the soil. Plant salt-tolerant trees such as birches and red pine near walkways and roadways where salt is often used. Make use of physical barriers such as burlap, snow fencing, and plastic fencing to protect sensitive species. Make sure to adjust the grade and improve the drainage around your plants and trees, so that salt gets removed when the snow melts. Watch out for signs of distress in your trees such as leafing out late, and sprouting smaller leaves, and rinse them to remove salt. Since the professionals know the best time of year to trim trees and are well-versed with various tree care services and techniques such as tree cabling, bracing, and pruning, it is crucial that you call for their assistance. The experienced professionals from DreamWorks Tree Services offer a complete range of tree care and pruning services to maintain and enhance the health of your trees and plants. To prepare and protect your plants for the upcoming winter weather, feel free to get in touch with our experts by calling 647-261-2627 or toll-free at 1-800-407-9917. You may also contact us to schedule a consultation with our specialists. With winter season around the corner, the threat of damage to your trees and shrubs due to snow, ice, and salt increases tremendously. The ice and snow that cover your trees can make the branches hang heavily, raising the chances of them breaking off.